As a Religious Education teacher, I regularly turn to the ‘Tube’ for some visual inspiration. Here are some of my top videos for the classroom. What if the next generation of young people became known as Generation Mercy? How would the approach the world differently? What inspiration might they gather from the first Christians? For 53 years, Justo Gallego has devoted his days to building a cathedral by hand on his land on the outskirts of Madrid. What were Jesus’ greatest achievements? How do we ‘win’ or ‘lose’ as Christians? 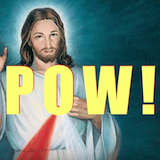 Watch our new original video and learn what Jesus’ version of the Olympics might be like. When we sin, what kind of judgement can we expect from the highest court authority of all – God? Watch our new original video, ‘Judge Jesus’, and learn about sin and forgiveness in the Gospels. Food was a big part of Jesus' life and ministry. Explore 'Jesus the foodie' in this video, then check out the Christmas 2015 edition of Australian Catholics magazine for more resources exploring food and faith.